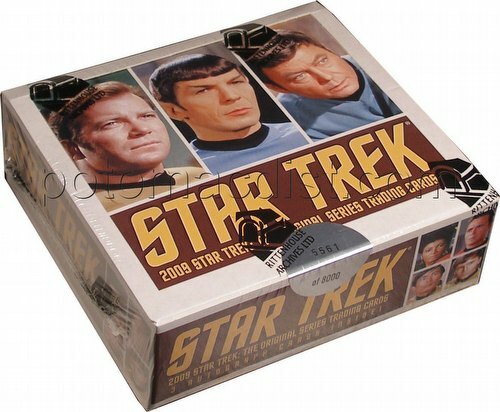 Every 2009 Star Trek: Original Series box includes 3 autograph cards! In addition to the 110-card throwback 1960s-style base set, collectors can look for bonus sets including an 18-card Tribute set, an 18-card Portraits set, and an 18-card TOS In Motion lenticular set. Signers include Williams Shatner, Leonard Nimoy, George Takei, Sabrina Scharf, and many others! Each case includes one of two different sequentially numbered 5"x7" Majel Barrett (Number One/Nurse Chapel) In Memoriam cards. 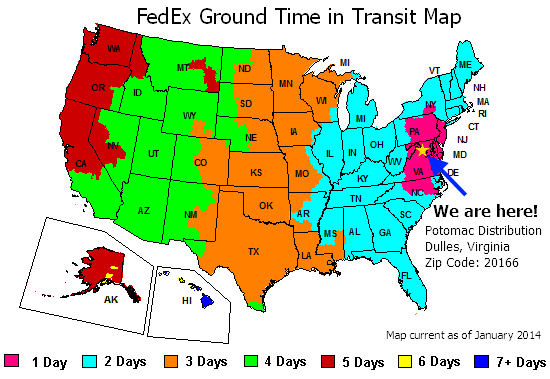 Customers pre-ordering 36 boxes (3 cases) receive a free Walter Koenig (Chekov) Autograph/Costume card. Customers pre-ordering 72 boxes (6 cases) receive a free Dual Autograph card signed by William Shatner and Nichelle Nichols in "Plato's Stepchildren." Customers pre-ordering 180 boxes (15 cases) receive a free Archive Box! Following up on 2007's and 2008's SOLD-OUT "Star Trek: The Original Series 40th Anniversary trading card" sets, comes 2009 Star Trek: The Original Series featuring all of the same unique designs and card-stock from our previous set, but focusing on the ground-breaking second third of the original series of Star Trek. 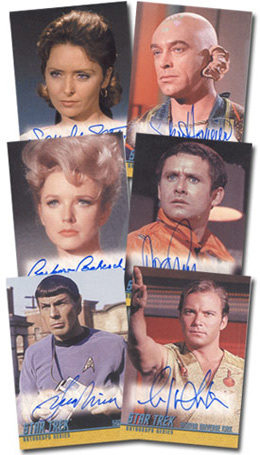  many other first-time Star Trek: Original Series autograph card signers! For every three cases pre-ordered of 2009 Star Trek: The Original Series Trading Cards you will receive an Exclusive Autograph/Costume Card signed by Walter Koenig as Chekov. For every six cases pre-ordered you will receive an Exclusive Dual Autograph Card Signed by William Shatner (Captain Kirk) and Nichelle Nichols (Uhura) in "Plato's Stepchildren"!